In presenting a 20 year membership chevron to Lion Derek Shaw, Brigid Hendy, Lions District Governor for Berkshire, Wiltshire, Dorset, Hampshire and the Isle of Wight commented that it is always a pleasure to recognise individual service to Lions. 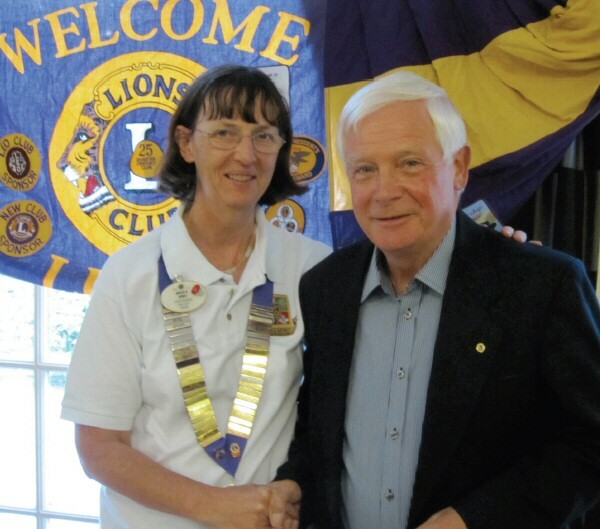 Brigid thanked Derek for his commitment to The Lions Club of Alton and to the wider Lion community. Derek has served as President twice in his 20 years and has always been a dedicated ‘fund raiser’ recently initiating a golf day, now in its third successful year, in support of the local REHAB charity. He is also a great supporter of youth and has maintained the club’s links with Alton College by becoming a college governor. Derek replied that the 20 years have been a very rewarding in terms of the real enjoyment that can come from serving the local community with life long friends.